As I have said in previous posts, one of the most important tools you can have in an EDC, BOB, GHB or even a 72 hour survival kit is a good flashlight. 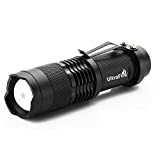 I usually try to purchase the best flashlight by the best flashlight manufacturers and give you a review so you can make an educated decision. However, this time I want to give you a review of the FordEx Group 300lm mini cree led flashlight. I recently purchased this little guy only because it was a cheap flashlight and for only about $4, how can you go wrong…right? Well lets take a look at it a little closer and you decide for yourself. You will be hard pressed to find any real information about the manufacturer FordEx Group I think it is because they make really cheap stuff and most likely made in Asia somewhere. What I can say is this super mini flashlight is bright, and has a blinding effect. The outer fins of the body help to give it a skid-proof and slip resistance in your hand. The output brightness can come out to be about 300 lumens with the adjustable focus. This comes in handy because I use mine a lot and can manage adjusting it with just one hand because the head slides in and out with ease to focus it. The super mini size is nice to hold in your hand but when not in use, you can use the spring metal steel belt clip. The compact size of the FordEx Group 300lm mini cree led flashlight is considered the best flashlight for hunting, cycling, climbing, camping and other outdoor activities. I am considering using this as an Every Day Carry light too. This small flashlight can receive a lanyard but does not have a keychain hole, so you can’t carry on your keychain. When I bought mine, I purchased it from Amazon here. I opened the cheap looking packaging, I was let down a bit cause it did not come in a manufacturers box but then I thought who cares its $4 bucks. It was wrapped in bubble wrap and came from Hong Kong or something. The flashlight doesn’t come with a AA battery so make sure you have one ready. I always use the best alkaline available, just so I can get more usage out of it, although cheaper batteries do work, just not as long. So far I am pretty amazed at the quality and operability of this flashlight. The FordEx Group 300lm mini cree led flashlight is bright enough for most of the basic tasks around the house or like I said, camping or hunting, etc. I was not sure if I would like the adjustable focus zoom but after using it a few nights, I really really do. Unlike many small single AA flashlights or even AAA led flashlights don’t have a tail cap switch like this one does. With one full push of the tail cap switch the light turns on to full brightness. A second slight push dims the brightness and a third light push produces a strobe effect. The order may vary depending on which cycle you are currently on when you fully depress the button to the power off. For more great reviews check out the review chart here. You can turn the FordEx Group 300lm mini cree led flashlight on at full brightness and depress the tail cap switch to dim and again to hit strobe, that is like the expensive tactical flashlights. It weighs just 65 grams and is just 3.7″ in length and 1″ in width. I really enjoy using this cheap little flashlight and will most likely buy another 1 or 2 of them just because of the functionality and price. If you are looking for the tactical style flashlight but don’t want to spend over $20 then buy a few of these things.